Casey Ryback has now retired from the Navy and is now a chef at the Mile High Cafe in Denver, Colorado. Ryback taking his niece Sarah Ryback on a vacation. They board a train traveling through the Rocky Mountains from Denver to Los Angeles. 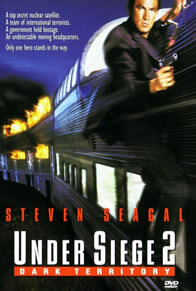 Travis Dane takes the train hostage and starts using the train as a control center in his effort to take control of a top-secret government outer space super-weapon. Dane built the weapon but was fired by the government before it was deployed. He has since hooked up with shadowy Middle Eastern terrorists who have offered him 1 billion dollars to use the satellite to blow up the Eastern seaboard by targeting a nuclear reactor that is located underneath the Pentagon. Dane lets the Pentagon know that he’s got control of the weapon by using it to blow up a Chinese chemical plant. Officials can’t stop him because they can’t locate his headquarters. As long as the train keeps moving, his location can’t be fixed. Ryback enlists a porter named Bobby Zachs to help him go after Dane.